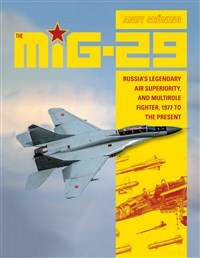 This book presents the development and operational use of the Soviet/Russian Mikoyan MiG-29. The MiG-29 was the Soviet response to the new generation of air-superiority fighter aircraft fielded by NATO, such as the American F-15 and F-16. The aircraft entered service with the Soviet Air Force in 1982, and was soon flown by many Eastern Bloc air forces. The fighter's performance came as surprise to the West, and modernized variants are still in service today. Described in superb detail are the many MiG-29 variants, and export models that flew in such countries as Algeria, Cuba, Hungary, India, Malaysia, North Korea, Peru, Poland, Sudan, Syria, Ukraine, and many others. Aircraft technical systems and armaments are also discussed in detail. Andy Gröning is a trained tool mechanic and worked for twelve years as a professional soldier in the Bundeswehr, including six years as an engine mechanic on the MiG-29; he was present when the aircraft was retired. His primary interest is Soviet–Russian military aviation.